Summit meeting participants at the Robert Wood Johnson Foundation headquarters in Princeton, N.J. hold a breakout session called a “fishbowl” to focus on project goals. In mid-March, individuals from an unusual mix of communities and professional sectors gathered at the headquarters of the Robert Wood Johnson Foundation (RWJF) in New Jersey. The group included the Foundation; Purple States, a documentary production company; Hollywood, Health & Society (HH&S), a program of the USC Annenberg Norman Lear Center; and advisors from across the country, whose personal and professional experiences span cultures and communities. At the day-long summit, they embarked on a frank and provocative conversation about how culture influences health. The group convened to begin the process of creating “Your Path to Our Health,” an immersive online learning tool designed to catalyze nationwide reflection on the challenging questions explored at the New Jersey meeting. “It’s intended to explore what peoples’ filters are and how they affect health,” said Dr. Michael Painter, a senior program officer for RWJF, the nation’s largest philanthropy dedicated solely to health issues. Earlier in his career, Painter was a family physician and chief of medical staff at a clinic in Seattle, providing healthcare to urban American Indians and Alaska Natives. “The idea for this online learning project began with Foundation staff interest in learning about the richness of North American indigenous cultures,” he said. “Originally we were focused on helping the Foundation’s staff learn more about these cultures. But the more we discussed it, the more we thought this learning journey might be important for our broader mission.” Painter and his colleagues decided to use experiential video to give others a chance to explore the role of culture through encounters with individuals who experience the world through different cultural lenses. The project is one element of the Foundation’s broader Culture of Health initiative, which is mobilizing national and community partners to improve the health of everyone in America. “Your Path to Our Health” is fueled by the belief that those who are trying to foster and act on a shared understanding of health need to start from where people are, from the particular cultural filters that communities use to navigate life and pursue their own wellbeing. To follow the project’s progress and participate in the conversation, please add your name to our mailing list by filling out a brief online form. The project’s advisory group members work on the front lines in different ways and in very different communities. They hail from Arizona, Connecticut, Colorado, Washington, Kansas, Kentucky, Mississippi, Montana, California, Florida, Georgia, South Dakota, New York and Alabama. They include advocates, health and mental health professionals, social service providers, researchers, community organizers and community-based media. They are African-American, Latino, Caucasians of various extractions, Asian-Americans and American Indians. They were selected for their collective range, their depth of knowledge and experience of how culture works on the ground and a willingness to do precisely what the online resource they’re helping to create is intended to do: challenge preconceptions and conventional wisdom, explore nuances, provoke reflection and deepen understanding. But what exactly does culture mean, and how does it affect health? How do we even start to understand the role of culture in America, a dizzyingly diverse country of 318 million where more than 300 languages are spoken? Participants insisted on the importance of appreciating the distinctiveness of particular cultures, but also generated some working definitions of what culture meant—ranging from a sense of shared values to a way of life. They agreed that “everyone has a culture” and that culture functions and can be leveraged in similar ways despite the differences that distinguish one culture from another. “I’m sick and tired of being seen as resilient when we’re all just trying to survive,” said Danilo Balladares, executive director of Sunflower Community Action in Wichita. Project adviser looks over posted notes listing hopes and expectations. 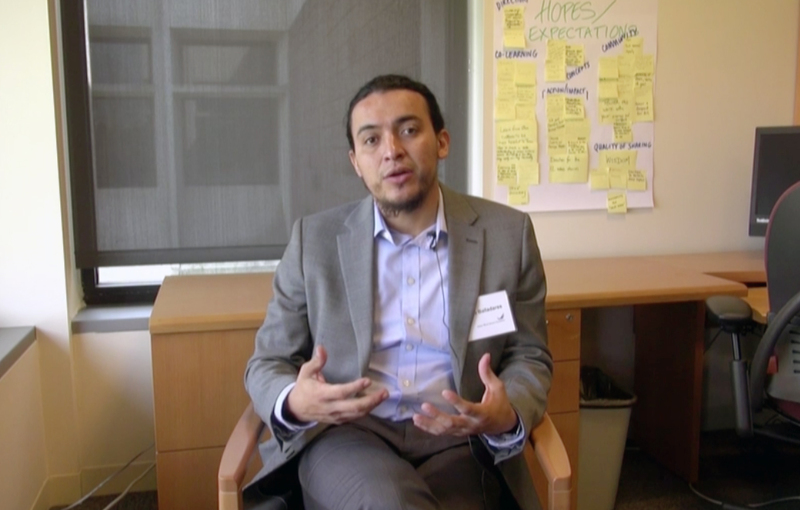 To galvanize this kind of conversation among culture of health sectors in communities and nationally, RWJF sought out partners who could create an online learning resource grounded in personal stories with the power to transcend stereotypes and reorient perspectives. Purple States specializes in video narratives that bring to life the human impact of policies and programs. Twelve short documentary videos will explore the experiences of individuals from communities in greater Los Angeles, Montana and greater Atlanta as they navigate a pathway to health. Three to five minutes long, the videos are meant to be thought-provoking “deep dives,” not comprehensive portraits or representations of an entire culture. To develop wrap-around content and online interactivity that prompts the viewer to move from these powerful personal stories to reflection on how culture functions in their own work, Purple States partnered with USC’s Hollywood, Health & Society Program. HH&S serves as a free information resource for the entertainment industry on TV and movie storylines on health and climate change. The Norman Lear Center’s Media Impact Project will develop and help implement strategies for assessing and marketing the resource. The initial target audience spans the sectors that are being mobilized to build an inclusive Culture of Health: public health professionals, non-profit organizations with the mission of promoting community wellbeing, educators, civic leaders, health professionals, advocates, employers and members of the philanthropic community. At the summit meeting, Purple States, HH&S team members, senior staff from RWJF and members of the advisory group began to identify what kinds of stories would be most illuminating and provocative. What mix of narratives can provoke a deeper and more nuanced appreciation of how culture affects the way people think about and pursue their own wellbeing? What unacknowledged disconnects are hindering attempts to promote health equity? What opportunities are going untapped? How can these stories best be presented so as to motivate Culture of Health builders to listen, observe, and engage in more respectful and productive ways with the communities whose health they hope to improve? 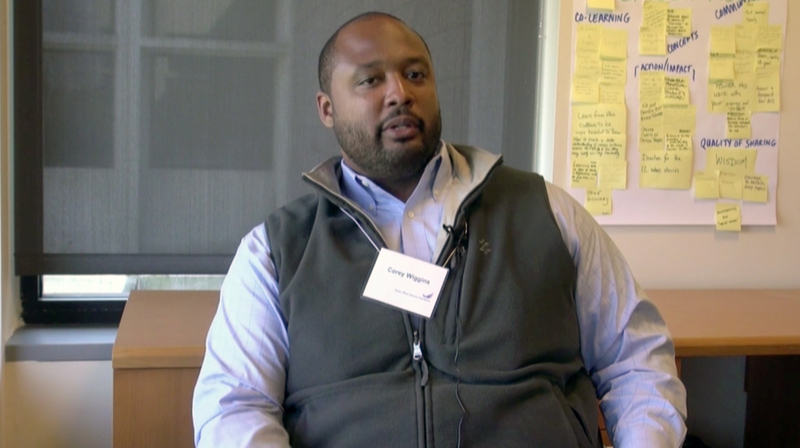 “As someone who works in policy and policy advocacy I’m always thinking about how systems and policies either inhibit or facilitate healthy behavior,” said project adviser Corey Wiggins, director of the Hope Policy Institute in Jackson, Mississippi. Another adviser who attended the summit was Emily Wang, co-founder of the Transitions Clinic Network, which provides services for returning prisoners with chronic health problems. In prison, day after day, inmates are awakened to line up for injections and medications, their mouths checked to make sure they swallowed the pills. Released from prison, “a man with diabetes now has to go to the pharmacy [to fill prescriptions] and learn how to inject himself with insulin,” Wang said. 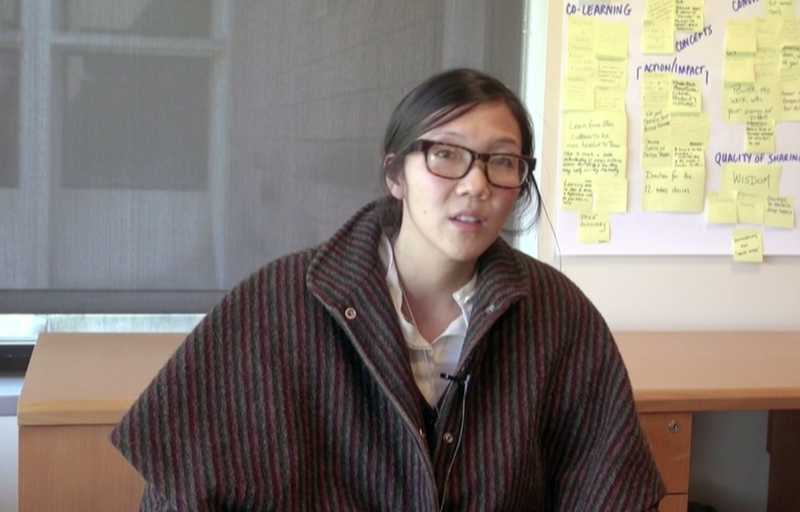 “These are experiences that are entirely new to him, and he has to learn this new system on top of trying to find a job, finding a place to stay and getting back with his family.” Incarceration, Wang observed, is a culture – and it affects millions in the U.S. and their attitudes and behavior when it comes to health. The advisers are setting the parameters and guiding selection of the themes for the videos. They will continue to challenge the producers to move beyond the typical “feel-good” stories or formulaic vignettes to do justice to the complex and significant role of culture in relation to the myriad other factors that influence health. Some of the advisers are functioning as guides to the featured communities, helping the producers identify and work with storytellers. Each video will point a possible way forward—but one that requires viewers to rethink their own assumptions and practices. Once the online resource launches in September, the advisers will also help the project evolve into a tangible, practical, widely-used tool for advancing the aims of the Culture of Health initiative. Filming of the first story has begun at a location in Compton, California. The storyteller is Esperanza, a 53-year old Mexican immigrant who takes care of her children, grandchildren and other relatives. Esperanza has been experiencing anxiety and depression. In her culture, the grandmother is the mainstay of the family, and psychological stress is not seen as a health issue. It is her trusted local priest who finds out what’s going on and accompanies her to a community clinic. The story invites the viewer to look beyond the most superficial reading: “if mental health is the problem, then access to health care is the solution.” But Esperanza’s experience will provoke the viewer to reflect on the subtle ways in which culture and health interact in the life of an undocumented Latina who is the lynchpin of her family. The project team’s learning journey begins with Esperanza. In consultation with the advisory group and Foundation staff, Purple States and HH&S are building on the experience of telling her story to develop a template for the integrated online modules. Each additional narrative will add new dimensions to this exploration of the interactions between culture and health, and lead to the launch of a dynamic learning resource in September, and the beginning of a thought-provoking national conversation. Join us as we travel Esperanza’s and others’ paths to our collective health. To follow the project’s progress and participate in the conversation, please visit and like our Facebook page, or add your name to our mailing list by filling out a brief online form.